Preheat oven to 375°F and line pan with 8 cupcake liners. Mix graham cracker crumbs, melted butter, sugar, and cinnamon. Divide mixture evenly between the eight cupcake liners and press firmly into the bottom and sides of each liner. Bake for 5-7 minutes or until golden brown. Let cool. While crusts are cooling prepare the filling. Beat cream cheese until fluffy. Add sweetened condensed milk, and mix thoroughly. Add lemon juice and vanilla and beat for a couple of minutes. Pour mixture into cooled graham cracker crusts and place in the refrigerator to chill until serving. Chill at least 20 minutes. Before serving top with kiwis, raspberries, and blueberries. You can serve the pies in the cupcake liners or remove the liners for a more elegant look. If a pie and a cupcake were to get married, these Individual Fruit Pies would be the delectable offspring that inherited all the things we love about both. In the sweetest knock-down, drag-out fight of the year, there is yet to be a clear winner in the pie versus cupcake debate. Cupcakes have long reined the dessert world. Of course everyone loves cupcakes -- they’re portable, versatile, and perfectly portioned. But pies are emerging as a serious contender. Pies come in all flavors and forms -- sweet or savory, hot or cold, fruit or cream. And don’t forget the crust! Whether it’s a graham cracker crust or pastry crust, we can’t wait to dig our forks into them. 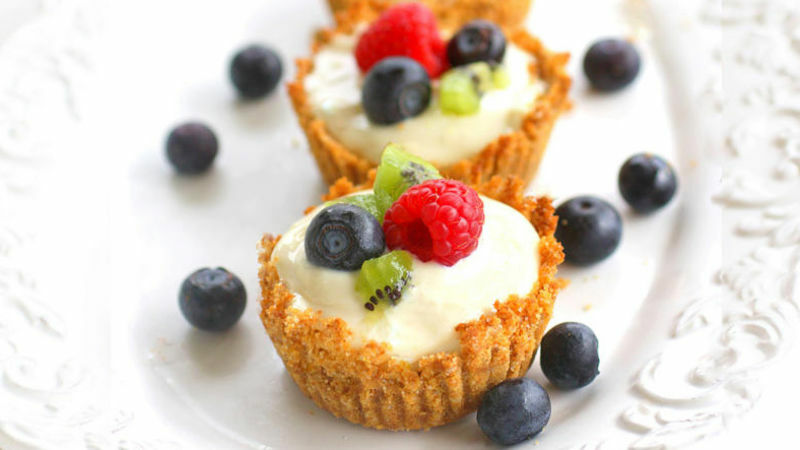 These Individual Fruit Pies have a sweet graham cracker crust filled with a lemon cream cheese mixture and topped with fresh fruit. Making miniature pies is made easy by baking the crust in none other than cupcake liners. With spring around the corner (not to mention bathing suit season lurking) these portion-controlled pies are perfectly light ending to any meal. Elegant and colorful, these pies are perfect for baby showers, weddings, or just dinner with friends. Time Saving Tip: Don’t have time to make a homemade graham cracker crust? Check your baking aisle for small individual graham cracker crusts that can easily be used instead.